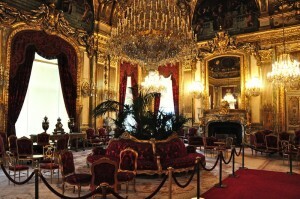 Home » Blog » Napoleon III (1852-1870) Room in the Louvre Palace Museum. This Drawing room (a room where one withdraws from dining), or Reception room is one in the suite of Napoleon III rooms in a wing of the Louvre. Looking at the back of the Louvre, from the Tuileries gardens, the wing on the left houses these festive rooms. One can clearly see the grandiloquent style of the Second Empire. It is Louis XV and XVI on speed! While many of the mid to late 18th century elements are present, all restraint has been thrown off and everything is “over the top” to extreme. This was a reaction against the severe neo-Classical furnishings of Napoleon’s Empire to Early Louis Philippe (1830-1848). This parallels in our own time the flamboyance of contemporary Maximalist or post-minimal design, as a reaction against pared down late 20th century Minimalism. The popularity of mid-century modern with its biomorphic egg, amoeba and sphere shapes popular in the first decade of this century provided a bridge between minimal boxiness and maximalist organic lushness. Hence the Napoleon III rooms have considerable resonance with avant-garde interior and clothing fashions. More is indeed more! ← From Minimalist Interior to Contemporary, by adding antiques and colour.